My sister invited me to join her and some artist friends in an Artist & Crafter's Open Studio on Mother's Day weekend. I'm thinking of offering knit scarves, wash cloths with soap or bubble bath, and maybe a few bags or sachets. I also want to put together a small book of easy-peasy knitting patterns to sell, and create journals and greeting cards with images of my collages if I have time. 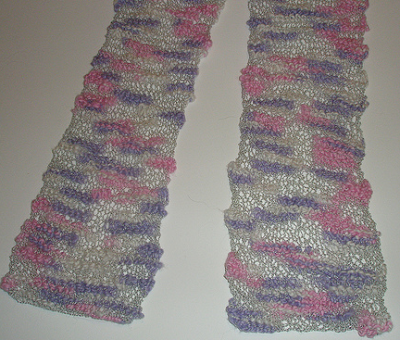 I'm working on another scarf like the one pictured below--- I want to have several for sale at the open studio. It's knit in simple garter stitch with Katia Colibria yarn.